Microbiomes and metagenomic studies have long been a special area of expertise for CAGEF. Our skilled technicians have experience in microbial studies ranging from soil and plant-associated microbes to mammalian gut and lung microbes. We apply our depth of knowledge to cutting-edge techniques to produce the best possible results for your research. We also offer advanced bioinformatic analyses for those who just want to get back to the bench. For metagenome sequencing, we require a minimum of 2μg of total DNA, at a minimum concentration of 25ng/μl. The OD260/280 for all samples should be at least 1.8. For microbiome sequencing, we require a minimum of 150ng of total DNA, at a minimum concentration of 25ng/μl. The OD260/280 for all samples should be at least 1.8. We typically use the V4 hypervariable region of the 16S rRNA gene for microbiome studies. We create barcoded amplicon libraries which we run on the Illumina MiSeq, using 150bp paired-end (x2) V2 chemistry. 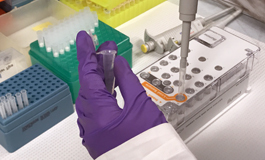 A maximum of 190 samples can be sequenced for one MiSeq run, which produces on average 50 000 high-quality sequences per sample. This will usually result in enough data to capture the entire microbiome extracted from the sample. However, certain high-diversity sample types, such as soil communities, may require a higher depth coverage and therefore fewer samples combined into one sequencing run. To ensure optimal results, please refer to our sample collection and DNA extraction guidelines below. Depending on the sample type, it may be beneficial to centrifuge and pellet the bacterial cells (for large volumes of liquids, such as waste water or breast milk), or to freeze the sample in liquid nitrogen and grind with a mortar and pestle (for large surface areas, such as leaves). Currently, we recommend extracting DNA for stool, soil, and plant tissue microbiome studies using the DNeasy PowerSoil Kit. For animal tissue, we recommend the DNEasy Blood & Tissue Kit. However, other kits have been evaluated for certain microbiome studies and may be recommended for specific sample types. Most importantly, we advise to select a kit and continue to use it throughout the study. The input quantities suggested above have been tested with the DNeasy PowerSoil Kit.